On the Tuesday after Palm Sunday, Jesus and his disciples return to Jerusalem from Bethany. On the walk, the disciples see the fig tree that Jesus cursed the day before. Peter points it out and Jesus now uses it as a teaching opportunity. Jesus encourages the disciples by telling them that with faith, they can do anything, even that which seems impossible. We must have faith that God will remove anything that hinders us from bearing fruit for him. In Matthew's account of this event, he portrays Jesus' words of judgment upon those whose lives are not fully devoted to Christ. Just as the tree was hypocritical - looking one way (fully bloomed), but in reality was another - so there is judgment for those who should be bearing fruit but do not. And just as the fig tree withered (as a symbol of judgment upon Israel), so God will remove any aspect of us that does not bear fruit. Jesus and his disciples continue toward Jerusalem. 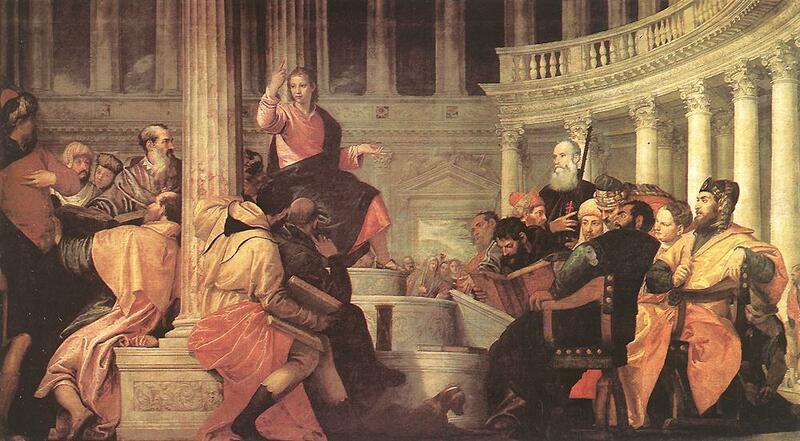 When they arrive at the temple, the chief priests and scribes begin questioning Jesus' authority. Faced with their hostility, Jesus refuses to answer. Instead he asks them a question (which they could, or would, not answer) and then begins speaking to them in parables (mostly about judgment on the leaders for their refusal to encourage the people to accept God's kingdom invitation). It is also during this discourse that Jesus gives the Great Command to love God and love others. The thing that strikes me most about this exchange is the leaders audacity to question Jesus. Think about this from Jesus' perspective: he knows that in three days he will be beaten and crucified and here are these snot nosed religious leaders questioning his authority? What an utter waste of time! There had to be more important things to do in order to get ready for Friday...and Sunday! And yet, Jesus takes the time to address them. In a round about way, he tells them that his authority is an out of this world authority that they will never understand. He returns their volley with a question of his own. When they can't answer, Jesus implies that because his authority is greater than any other authority, not only on earth, but in all of the cosmos, he will not give them a direct answer to their question. And Jesus moves on, continuing to teach and do what he can to prepare the people for what is to come. At the close of day, just as he has done the past few days, Jesus returns to Bethany; one day closer to becoming our Redeemer.